understand how tough it is for these vendors. The Rickshaw Truck already got their first ticket ($100+) trying to park a little farther south this morning, and were threatened by a halal guy in their second spot. Let’s hope the third one is a charm. 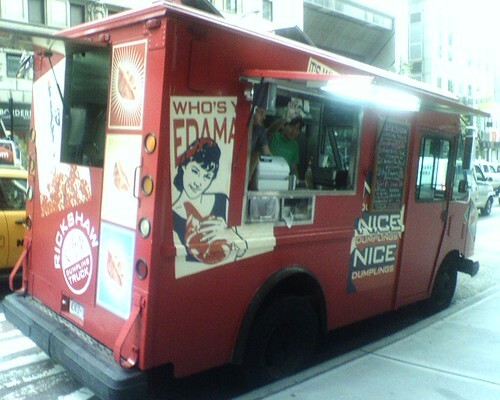 In happier news, there will be a Treats Truck/Dumpling Truck double team tomorrow on 45th btw. 6+7th for those of you on the west side. Full dumpling report coming soon. Posted by Zach Brooks at 12:17 pm, September 30th, 2008 under Uncategorized. What happened to the Rafiqi’s cart that’s normally in that spot at 57th and Park? I had to walk, like, three extra blocks to get my white sauce fix yesterday. I feel bad, the line was small at the Rickshaw Dumpling cart, but long right next to it at the Treats Truck — hopefully in time people will catch on and support it! If I didnt have to go to a ‘real restaurant’ for lunch, i would’ve been getting my dumplings for lunch. Went to the dumpling truck today. No line at all, but the Treats Truck next to it had an overflow crowd as usual. Prices are way too high. I got an edamame side for $3, but it was a bit small. Very friendly employees, though. If they just lowered their dumpling price a buck or two, I bet the line would be a LOT longer. Went there today, no line, a little bit pricey BUT the dumplings I had were very good. Chicken with Thai Basil. Got the edamame. Too salty, not exciting. Man, I miss Ollie’s. how is the edamame too salty? They give you a side of salt with none actually on it so you can put as much as you want on. I was referring to the edamame dumplings. The filling is salty.